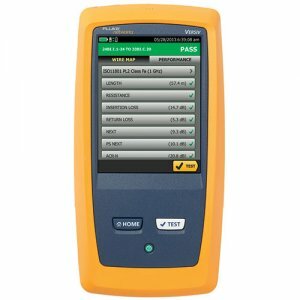 The Fluke DSX-5000QOi 1 GHz DSX Series Cable Analyzer with OLTS Quad, OTDR Quad and Fiber Inspection copper test solution enables testing and certification of twisted pair cabling for up to 10 Gigabit Ethernet deployments and will handle any cabling system whether it is a Cat 5e, 6, 6A or Class FA. Certifying a cable is one part of a process that starts with system design and ends with system acceptance. The faster that process goes, the more profitable you’ll be. Unfortunately, there are a lot of things that slow the process down - setting up the tester incorrectly, testing to the wrong limits, waiting for skilled technicians to analyze and troubleshoot failures, misinterpretation of results, and producing test reports that customers can not understand. It all starts with 9-second Cat 6 Autotest that means you can meet TIA-568-B and ISO 11801:2002 certification requirements and receive structured cabling warranties much faster than ever before. With all this speed also comes increased accuracy. 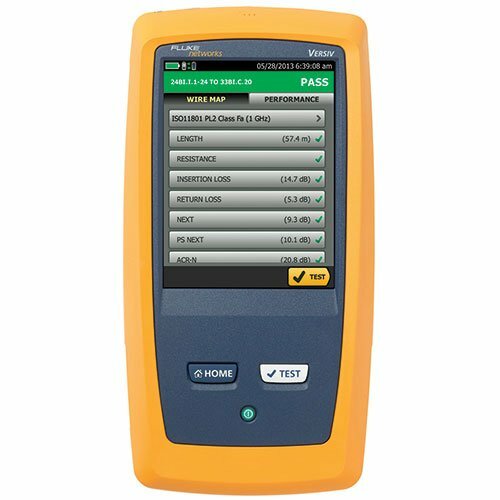 The Fluke DSX-5000QOi 1 GHZ DSX Series Cable Analyzer is the only independently verified tester to obtain UL classification for ISO Accuracy Level IV. Fluke Network DSX-5000QOi Cable Analyzer meets the Intertek (ETL) Certification in accordance with the IEC-61935-1 specifications for accuracy Level IV, the draft accuracy Level V and in accordance with the ANSI/TIA-1152 specifications for Level IIIe.